In order to submit an offer to buy Cool.com, the prospective buyer must pay $39 in addition to a commission. I do not recall seeing Uniregistry with this pay to inquire offering before. This Domain Buy Service appears to be similar in nature to what other companies offer. Domain Agents has a similar offering for $19.95, and the company guarantees that the offer will be presented to the domain owner. With Domain Agents, the domain owner receives $10 for responding to the inquiry. Domain investors can park their domain names with a Domain Agents inquiry form, and prospective buyers can submit offers to buy domain names that aren’t using the Domain Agents platform. GoDaddy also offers a similar type of service where a prospective buyer pays to submit an offer using one of their brokers. GoDaddy charges $49.99 plus a 20% commission. Prospective buyers can use GoDaddy’s service for domain names that aren’t listed for sale via GoDaddy. 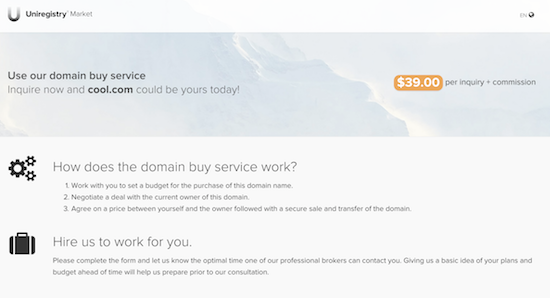 SecuredOffers.com is another service that charges $19 to submit an offer to buy a domain name. Many investors who use services like these do so to weed out tire kickers and unqualified buyers. The thinking is that someone who is going to make a fair offer will be ok with paying a nominal amount of money to submit their offer. I can’t imagine it is a profit center, but I am sure it eliminates many unqualified prospects who would likely waste a domain broker’s time. I am not sure when Uniregistry introduced the service, nor do I know if it is available to all clients. One thing of note is that it appears to shift the burden of paying a broker’s commission from the seller to the buyer. Update: It seems that this was some sort of error. When someone searches for a domain name not listed for sale on Uniregistry Market, they are given the option “Hire a broker now to acquire it from the current registrant.” When they click the “Get Started” button, they are taken to a landing page that looks like the one I saw. I am not sure why this was shown for Cool.com, but it looks like the standard landing page is back. That is simply the default lander when you have selected the Uniregistry Market nameservers but the domain is not listed at the Uniregistry Market. At least a year old. I have never seen the pay to inquire form at Uniregistry before. Also, the way it reads “$39.00 per inquiry + commission” would seem to indicate that the buyer is paying the commission rather than the seller, and that seems to be new at Uniregistry. I forwarded the article to Jeff Gabriel and Frank Schilling, so perhaps they can share more information about it, including when it was introduced. Richard is right, someone did not add this to their account, but nameservers point there. You can try it yourself by removing one of your names that have the ns1.uniregistrymarket.link nameservers from the market temporarily. If you reload it will show you this pay to inquire landing page. Thanks again for the opportunity to respond to your drivel. Yes, we’ve been doing this for almost 7 years now. It’s a good way to qualify leads and since we share the money the buyer pays with you, it’s also a good alternative to parking. We also offer the option of turning off the requirement to buy a credit, if you prefer that. Either way, the buyer pays the commission when you use Make Offer on DomainAgents. Domain Agents does not pay for all leads, and negotiations. Just to be clear there are certain leads they do not provide a credit for. One of our registrar partners allows free offers on some names and we can’t pay on those since there’s no credit to share. It’s a small percentage though. Any lead you send yourself via your landing page or referral link, you will be paid for (unless you’ve chosen to allow free offers yourself.) On your landing pages, you can also choose the minimum offer allowed. I think the platform is great by them. Great service also. I only wish the money credits lasted permanently in the account. You have a time frame in which to claim them. That said, it’s still a great service. Cant see any point in that. If someone is up to trolling the owner, they still can do that via whois email. I don’t own really cool domains, though. Yet, I think even someone who does (and thus has a lot of incoming requests), would not have much trouble responding with a “your input is very much appreciated, feel free to contact us again anytime” reverse-troll polite template or just ignoring unpleasant communication. Makes sense, Thinking can I do this with my in box spam ? Cool.com was one of the first domains I read about when I first got into domains. I read that the owner was offered $8 million in cash and $30 million in stock but turned it down. Have always wondered what the FMA guy paid for it after that. P.S. From the headline I was wondering if this was going to be the great big announcement. That would have been pretty crazy. I posted an update to the article a moment ago.